I was excited about receiving this book after noticing that it was O, The Oprah Magazine‘s Cookbook of the Month. I love Asian food and this release by Clarkson Potter is full of delicious recipes. 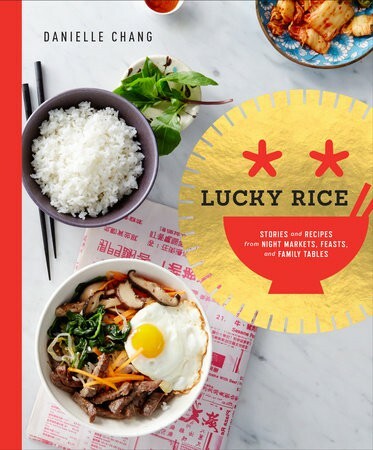 This is a REVIEW: Lucky Rice Book by Danielle Chang. Leafing through the book, it is a bit challenging to veganize everything here, but if you get creative with swapping out ingredients…you can still enjoy the Asian flavors. My favorite swap for beef are portobello mushrooms. For recipes calling for ground pork, you can either use a vegan alternative or even tofu. The book is divided into the following chapters: Street Eats, Funky Foods, Snacks and Grub, Soups and Broths, Spicy Dishes, Asian Mash-Ups, Rice Bowls and Beyond, Lucky Feasts, Cocktails and Sweets. A few recipes definitely stood out for me. They include: Fava Bean Puree with Preserved Mustard Greens, Kimchi Tacos (using portobellos), the sauce for Tikka Masala (use vegan yogurt) and for dessert, Almond “Tofu” with Fruit Cocktail. My only wish for this book were more veggie dishes. Also, some of the recipes call for quite a few and/or hard to find ingredients. However, as an book full of ethnic-inspired recipes, not completely unexpected.